Results for category "Other Liquors"
4 PM: Breakfast Achievement Unlocked. 4pm: Breakfast Achievement finally unlocked. 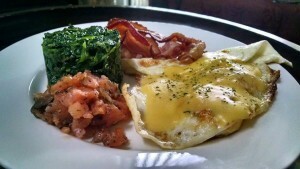 Whiskey bacon, dill salmon lox, creamed spinach and eggs fried hard with lazy hollandaise. Better late than never, right? 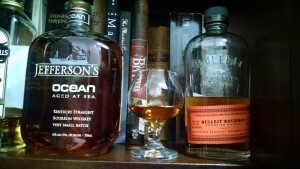 Tasting Notes Bourbon Edition: Jefferson’s Ocean Bourbon. We interrupt our regularly scheduled Gin Tasting Notes to bring you a special Bourbon Edition. I’ve finally gotten my hands on something I’ve long coveted, Jefferson’s Ocean, an extremely small batch bourbon aged four years out to sea in barrels over 10,000 miles. The regular movement of the ocean allows the bourbon constant contact with the barrel wood, while imparting a subtle brine from the salty air. I’ve some Bulleit’s bourbon for contrast, a decent drink for enjoying a good cigar. Verdict: Jefferson’s is absolute ambrosia on the nose, and that’s where you’ll pick up most hints of brine. It makes Bulleit’s smell like paint fumes in comparison, and you can bury your nose in the glass indefinitely with no risk of singeing your nose hairs. 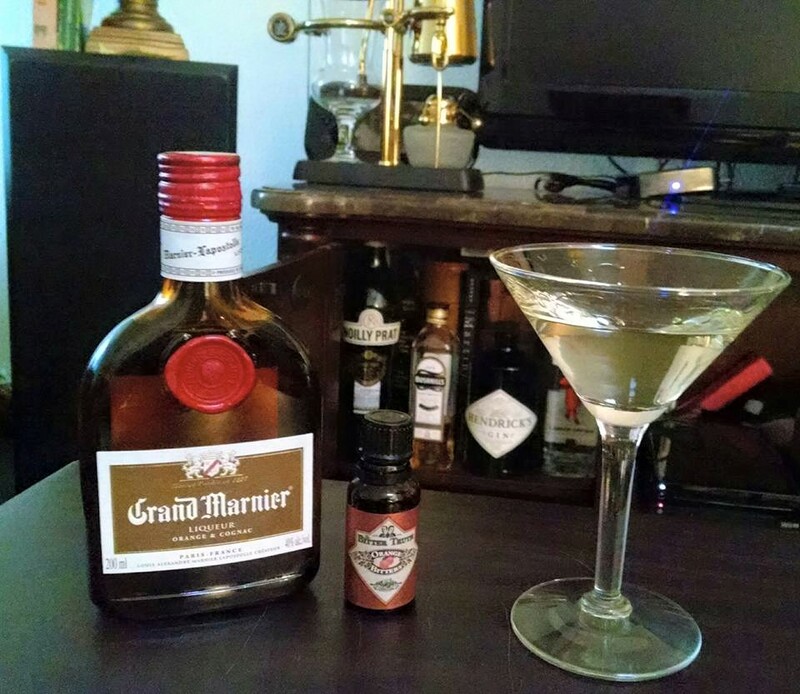 It’s rich and complicated on the palate, lingering in the mouth while constantly evolving. Certainly worth the steep price tag. But if any friends swing by and I let you try some, you’re putting out at the end of the night. No, seriously. Just mentioning the price has me almost swallowing my tongue. Gotta recoup somehow. 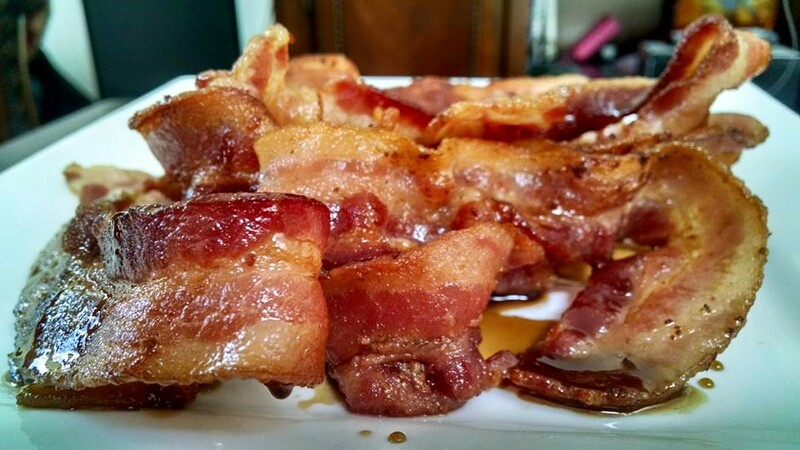 This is a recipe I received from a dear friend in Scotland: bacon slow-fried in whiskey. The instructions were a little vague, so I filled in the blanks: the thickest bacon I could find, a quick marinade in good whiskey, then slowly fried over 40 minutes with continuous pourings of fresh whiskey every 5 minutes. 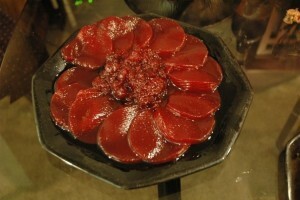 I then drizzled the finished product in a whiskey reduction sauce. I could say it came out okay, but that’s a lie. This is ambrosia of the gods. With the marinade and the sauce my house smells like the Willy Wonka factory of whiskey. Whiskey doesn’t smell this good in the bottle. New Year’s Eve Dinner & Cocktails. Happy New Year’s Eve! (And Happy New Year’s Day to my friends on the other side of the world.) Champagne drinks will be in the New Orleans historical tradition, dinner will be in the Greek tradition. So, Diamond Fizzes and Raspberry Diamond Fizzes will accompany red wine braised lamb shanks (αρνι κοκκινιστο: arni kokkinisto). Let’s do it! 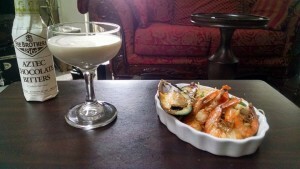 Two Gin Cocktails & a Refreshing Repast. 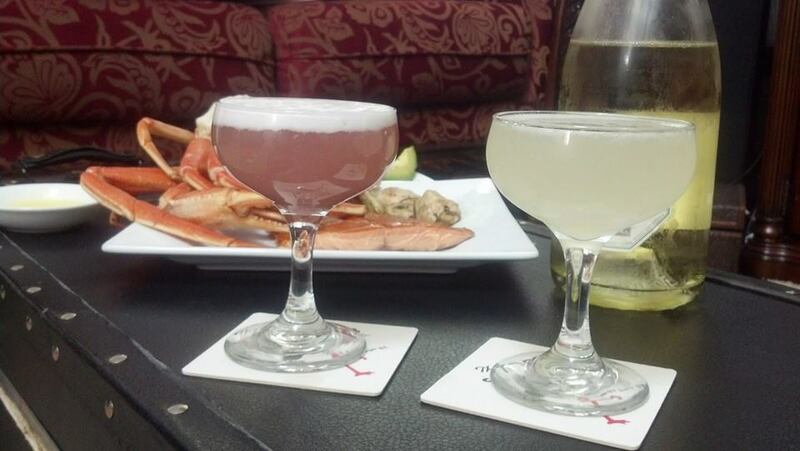 Here’s two vintage champagne cocktails: a Raspberry Diamond Fizz on the left (with egg white, I’m feeling brave and it’s friggin fantastic), and the French 75, made famous by the Stork Club in the 1930s. Both are accompanied by a simple meal of crab legs, pan fired oysters, and sliced avocado. Sunday Champagne Brunch! 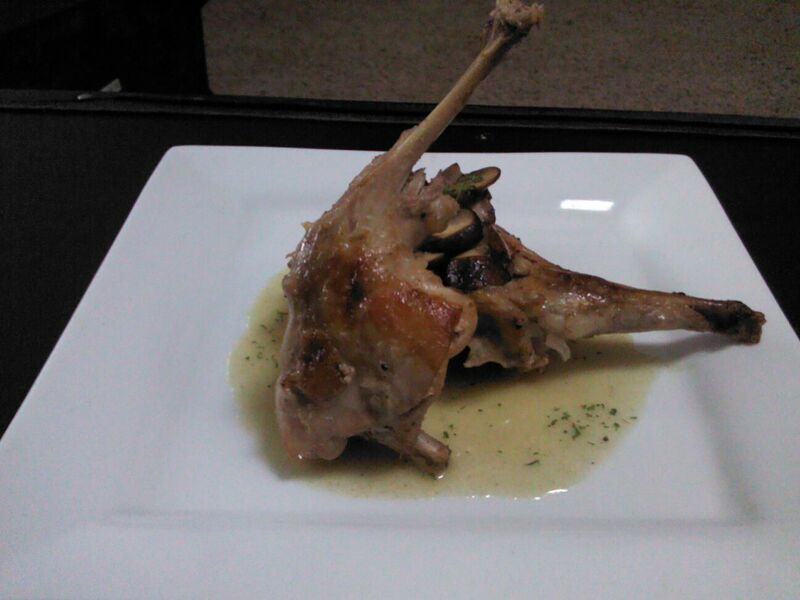 I cooked Bugs Bunny. It’s wabbit season! I simmered my rabbit in some of my homemade hard cider, which I finished into a sauce.